Sundays: 9.30 am Sung Mass. 9.30 am Family Mass (first Sunday of the month). 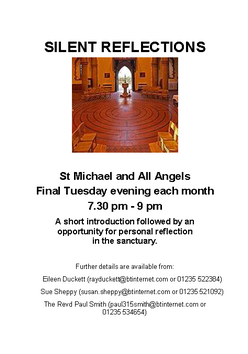 Silent Reflections last Tuesday in the month at 7.30 pm. Wednesdays 10.30 am at St Helen's. Thursdays 12.30 pm followed by a light lunch. For Baptisms, Weddings, Funerals please contact the Parish Office (01235 520144). Silent Reflections 7.30 to 9.00 pm on Tuesday 30th April 2019. Moving into Stillness circle dancing to Taizé music with silent interludes 9.45 to 10.45 am Thursday 2nd May 2019. Elizabeth Mitchell will be the teacher. No prior experience/partner needed. World Labyrinth Day is Saturday 4th May. St Michael's will be open from 12.30 pm - 2.30 pm for people to walk and pray the Labyrinth. In particular we hope to have a good number of participants at 1 pm to join in the worldwide 'Walk as One at 1' which aims to 'create a peaceful wave of energy as the world turns'. At St Michael's this will be followed by prayers and a simple bread and cheese lunch. All are welcome. Easyfundraising.org.uk Please bear in mind that if you shop online you could be raising money for our church. For more information, follow the link. The unique link to our charitable cause is http://www.easyfundraising.org.uk/causes/stmichaelsabingdon, the Church of St Michael and All Angels Abingdon. Over 2400 well known retailers including Amazon, M&S, Boden, Waitrose, House of Fraser, and many more will donate a percentage of what you spend to St Michael's when you shop with them, via fundraising website http://easyfundraising.org.uk. The Abingdon Area Archaeological and Historical Society has created a web site that contains information about the most interesting historical buildings, streets and people in the town. The current issue of The Window, the (usually) monthly publication of the Parish of Abingdon-on-Thames is available to download. Printed copies are available in each of the three churches in the parish. St Michael and All Angels' Church is a Church of England church located in the west of the town, adjacent to Albert Park. The Church of England churches in Abingdon are organized into two Benefices, Abingdon-on-Thames and Abingdon North. Abingdon-on-Thames is a Team Ministry, to which St Michael's church brings a distinctive Anglo-Catholic tradition. Almost all the Christian churches in the town are members of a Local Ecumenical Project, called The Church in Abingdon. 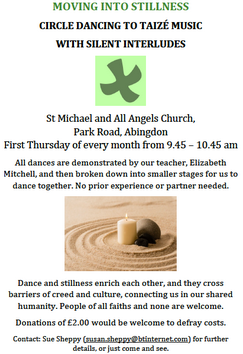 The Local Ecumenical Project recognizes a spirit of co-operation and ecumenism that has existed in Abingdon for many years; Christians of all denominations unite to work together whenever common action is possible and to share in and be enriched by each other's traditions of prayer and worship. St Michael's Church has very strong links with our neighbours at Trinity Church. Within the Anglican Parish our Team Vicar is also Team Vicar of St Nicolas'. St Helen's, St Michael's and St Nicolas' are the three Anglican churches in the the Benefice of Abingdon-on-Thames. The church was designed by the architect Sir G.G. Scott, and built in the period 1864-1867. It was consecrated on 25th January 1867. The interior was redecorated in January 1999. Pevsner in his famous books The Buildings of England describes St Michael's as 'a quiet, dignified design'; a phrase that might also be applied to our main act of worship, the Sung Mass at 9.30 am each Sunday. A history of the church, 1867 - 1967, was written for the centenary of the consecration of the church by J.C. Norris. The centenary was celebrated with First Evensong on 24 January 1967, High Mass and Sermon on 25 January, and Sung Mass and Sermon (preacher: The Revd Canon D. Nicholson, Vicar of St. Mary, Bourne Street, London and Superior General of the Confraternity of the Blessed Sacrament) followed by Evensong on the Sunday in the Octave of the Dedication Festival on Sunday 29 January. The church was extensively re-ordered in 2008/9, prompted by the identification of a serious problem with the floor timbers. The rationale for the re-ordering and the creation of a new liturgical space is described by Canon Peter Doll (Team Vicar of St Michael's at the time) in an article entitled "The Temple of His Presence", in Pews, Benches and Chairs, Church seating in English parish churches from the fourteenth century to the present, edited by Trevor Cooper and Sarah Brown, published by the Ecclesiological Society, 2011. The Nave Altar was designed and constructed by local furniture makers Bates and Lambourne of Thame. There are photographs of the altar on their web site. The altar was consecrated by the Rt Revd Colin Fletcher OBE, Bishop of Dorchester (and at the time Acting Bishop of Oxford), on the Feast of Luke the Evangelist, 2015. Until 2017 two of the three church bells had been unused for many years and had become derelict. They were restored by Whites of Appleton and re-dedicated by Bishop Rowan Williams at a Sung Mass and Confirmation celebrating the end of the church's 150th Anniversary Year on the Feast of St Michael and All Angels 2017. The Abingdon Area Archaeological and Historical Society maintains a web site that contains further information about St Michael's Church and other historic buildings in the town. The tradition at St Michael's is Anglo-Catholic, with an emphasis on community, corporate worship, meeting God in the sacraments, in the scriptures and in one another, and above all seeking to teach and live the Gospel through our own lives in the situations in which we find ourselves. The main Sunday service is a Sung Mass at 9.30 am. and Evening Prayer at 4.00 pm. The sermon is an important element of the Sung Mass. On the first Sunday of the month the 9.30 am service is a Family Mass. During the week we have a Said Mass on Thursdays. For times, see the Calendar. There is a Said Mass at St Helen's Church on Wednesday. On Festivals and other Holy Days we usually have a Sung Mass at 7.30 pm. See the Calendar for precise details. During Holy Week and Easter we celebrate the traditional liturgies for Maundy Thursday, Good Friday, the Easter Vigil and Easter Day. The centre group of churches combine for the major act of worship on Trinity Sunday. There are periodic quiet days and an annual pilgrimage to Walsingham. The church has disabled access; large print service books are available and a hearing aid loop is installed. Young people and families with young children are important members of our congregation; they are in a real sense the messengers of our tradition. Baptisms take place on Sundays, usually in the afternoon, but at other times by arrangement. We try hard to maintain contact with families after their children have been baptized. Our Carol Service on Christmas Eve is a wonderful magnet drawing families together to begin the celebration of Christmas. St. Michael's Fellowship meets periodically. All members of the congregation and their friends are invited to meetings. The format is normally a talk followed by refreshments and discussion. Talks cover a very broad range of topics. Talks are frequently illustrated with slides and videos. The Fellowship is an important way in which a sense of community is nurtured, through sharing of background, interests and experiences of life. Coffee and tea are served in the church after the main Sunday service. This is an important social meeting point for the congregation. Refreshments are served after evening Mass on major festivals. We have an annual Christmas lunch at a local restaurant, which is well-supported and family and friends are particularly welcome to come along. The Church Room is used by various groups and enquiries about availability are welcomed. Music is important at St Michael's. We have a small but committed choir, which combines with that of St Nicolas' for occasional services. We appreciate the services of very able organists. Through The Church in Abingdon we are building links with churches in Abingdon's Twin Towns. St Michael's is a popular venue being located next to Albert Park with easy access. We have an important ministry through baptisms, weddings and funerals. We support the work of TARIRO - Hope for Youth in Zimbabwe, local charity The Abingdon Bridge (TAB) who support young people in Abingdon in challenging circumstances and the Church Mission Society. At Harvest Festival, we support the homeless through the Steppin' Stone Centre in Oxford. We also support the Abingdon Emergency Food Bank, run through Christ Church, Abingdon. We hold an annual Mini-mart, which supports the work of St Michael's and other nominated charities.